This week I want to re-share a couple of posts with you that 'pin my colours to the mast'. I am deeply troubled by all the hype around Black Friday and the endless consumption of mass produced items that the corporates are trying to foist upon us. So here is my line in the sand. I believe in something a bit different and invite you to dip in and share it with me. Being formed directly by the hands of the maker, so they fit beautifully into the hands of the maker. I have handled 10,000 year old pots, decorated with the finger impressions of the ancient maker, complete with fingerprints. It created an powerful sense of connection to that person, so distant in time, and of our shared humanity. The clay carries a record of all the movements used to make and finish it, giving not only the main form and profile, but also a plethora of small details, perhaps throw lines, or a smudge where it was picked up and moved. I enjoy the way in which the firing then makes this history of tiny gestures in time permanent. Potters tend to use less highly processed materials, and to enjoy clays and glazes that yield up movement and variation when they are fired. From a distance a simple looking black pot may be discovered to have rough, matt and smooth textures, warm toasted areas, flushes of various other colours where the glaze is thinner or thicker, dark spots where iron from the clay has interacted with the glaze, flashing from flames or vaporisations of minerals from the glazes of neighbouring pots in the kiln, This gives the finished piece a depth of character that you can get to know better with time, so it stays interesting over the longer term and rewards close attention. Because each piece is individually made, even a set of skilfully made and closely matching pieces will still have slight variations, so they embody both individuality and family connections. The work of each potter comes with an interesting back story of how they trained, what has consciously and subconsciously influenced and inspired them, what they are interested in developing. A narrative and heritage which we can then associate with a particular pot. I value individual creativity, thoughtfulness, and having a home furnished with unique things that I have chosen. Selecting hand-crafted things to share that living space concretises my values and gives me happiness every time I see a piece. They make me feel more me. At base, clay is a fundamentally organic material, it is shaped by the intentions of the maker, but it continues to carry the character of the particular ball of clay, and it is then transformed at enormously high temperatures. This can be orchestrated by the skilled maker, but there is an element of wildness in the process that cannot be entirely controlled. This is humbling lesson for the person working with the clay, but as modern life becomes more and more mass produced and urban that sense of wildness and elements beyond our control is an important one for us all. Using handmade pots, for example is serving food, provides an excellent frame for the dishes they contain. If you have gone to the effort of finding seasonal or artisanal produce and cooking it well, it deserves to be noticed, attended to and fully savoured by the people it is served to. A handcrafted serving dish will complement the food and help to encourage the attentions of the eaters. Buying handmade pots supports a world in which people can survive as working potters and independent retailers making and selling what they love, and that is a world I prefer to the alternative of mass production and corporate profit! This is a post I first posted 3 years ago and as all the black Friday madness kicks in again I thought I would re-share it with you. I find it useful to remind myself of the kind of world I want to live in and to think about how the ways in which I act now help build that world - or not. This Saturday is also 'Small business Saturday' which gives us a good contrast of some of the options we are choosing between. I know you guys out there are thoughtful too so I encourage you to take a moment to consider what you really value and perhaps find ways to fit more of it into your life this festive season. I love finding the right gift for someone but I've long had an ambivalent relationship with Christmas shopping, and now I'm a maker it has only got more complicated. I am challenged by the consumerist festival-of-shopping characteristic Christmas has acquired, with massive marketing budgets being spend to drive us all into a frenzy of credit-fuelled shopping. It seems pretty clear that those corporate retailers are using those budgets to manipulate and profit from our natural needs and desires, without ever actually fulfilling the need as they promise. It's not done for our best interest but to feed their bottom line. That leaves a pretty bad taste in the mouth. For years now I have avoided the mainstream shops as much as possible and gone to craft fairs or independent retailers on or offline, choosing to spend my money on gifts that are closer to my personal values. They might be hand made, or ethically produced or fairtrade/organic etc. I hope the recipients enjoy them, I feel better about where my money goes - and I get to avoid the worst of the high street frenzy. Win-win-win! As a maker now, the Christmas season is my busiest time of year and so far accounts for a fair percentage of my annual turnover. Without it the business would be in trouble. But it's a bit weird being dependent on other people's Christmas shopping and trying to make the most of it without turning into a miniature version of one of those rampant merchandisers I hate. I can see the appeal of the minimalist approach but I've always been a thing person so my take on it all is more inspired by the new materialism which suggests that we move away from the never-ending over-consumption. Instead they put out a new manifesto urging us to have fewer things, love them more, to take care of them, share them and choose them more wisely according to our own values. This works for me as a person in that I need not clutter up my home or spend money I don't have. Instead I can focus on the things I really need or love and enjoy them for longer. It also works for me as a maker as I hope that useful things that look good and are individually handmade with love will be something you want to keep and treasure. So I would like to invite you to have a thoughtful approach to what you buy and take home or give to others, choosing really lovely things that support your own values and enable you to create a home that expresses who you are. I think hand made things are better at creating connections so they make better gifts too. While I was pondering the topic for this month's newsletter I heard about a new campaign called #justacard. This highlighted the fragility of the economy for independant traders and makers and the power that shoppers have to support them - or not. It underscores the power of shopping choices to support the type of world, the type of community, the type of high st we want, even by making quite small changes. It fitted nicely with the issues I was considering so it feels fitting to mention it - I hope you will check it out and consider supporting it. I'd also love to hear your thoughts on the issue, please leave a comment below if you'd like to share what you prioritise at this time of year. Have you pondered becoming self-employed and found that it looked utterly terrifying with a huge risk of failure? Two important people in my life are currently going through this process and in conversations with them I noticed something that I recognised from my own experience. In looking forward into a self-employed future it seems as if there is a fixed term to try and make it work, at the end of which there will be a clear judgement of your success or failure. When I started out I remember giving myself a year to see if I could make it work. Of course, at the end of that year there was no big judge in the sky looming over me to pronounce on whether I was a success or not. In reality, some things had worked well and some things had not. I had made changes, learned shed loads and revised and revised how much money I thought I needed to live on and what I thought success even looked like. So I offer this thought out there, in case it may be helpful for anyone else facing the fear of failure in a new enterprise. In reality there is probably never going to be a moment when you stand on the line and either pass or fail. It's an ongoing process with a mix of successes and failures and it's totally possible for you to see all aspects of your enterprise and keep altering the course, developing the tactics and doing a little better each time. Five years in it still gives me the fear, but I think I'm getting better at living with that and carrying on anyway! We'll definately all need to find ways to improve our skills at the content of our businesses - and our business skills, but perhaps it's not as terrifying as it looks! By coincidence I came accross this blog post from Leo Babauta this morning outlining 3 practices for the overwhelmed, stressed and anxious. If you're into meditation etc you may find them helpful. If you're not you can at least take some comfort from knowing that everyone gets the fear sometimes and yet the sky generally does not fall in. Good luck! To mark the occasion I'd like to share some thoughts on something I've been pondering for a while. It struck me that when women share images of other women, perhaps daughters, sisters, mothers, friends, on social media something interesting happens. Their friends and followers want to engage and to say something positive - which is great. More often than not however, the commenters end up saying something about the depicted woman's appearance and how lovely they look. I love that the commenting women want to connect and to say something positive about the depicted woman and her relationship with the posting woman. BUT! It saddens me that women are so quick to comment on each others' appearances. We all know that we get judged this way in a patriarchal culture. And it's not surprising that we to some extent externalise those judgements and end up using those criteria ourselves. It's also not surprising that we'd want to counter the conventions of negative judgements about appearance and say something positive to each other. It seems to me however that continuing to prioritise appearance as the most important aspect of a woman is tragically limiting. So today I'd like to take the opportunity to encourage you to be aware of what aspects of a woman you choose to focus on in your comments and to urge you to dig a bit deeper and find something that has more to do with the content of the character and less to do with the contours of their skin. I've started the ball rolling with some words to describe some of the women I know. All of them are wonderful in their own ways. All of them are more than beautiful. All of them deserve to be recognised for what makes them special! This weekend Ceramic Art London comes to town. Mine was a visit of two halves. Firstly the pleasure of seeing great work, including some of my favourites shown below, and secondly some more abstract thoughts on chaos and control. And here's a little number that came home with me to take up position in a highly compartmented bookcase with a collection of small white ceramics I inherited. After visiting any number of craft shows now I find that I am often drawn to both the more minimal, monochrome pieces, such as the van Bussel, and to more expressive textural pieces, such as the Keeley at the top. Initially I thought of these two as opposites in a linear polarity between chaos and control. I was most drawn to the more 'chaotic' end of the spectrum so it slightly perturbed me that my work seemed to be going in the opposite direction becoming more controlled and precise. This morning, reflecting on this, it seemed rather than being dichotomous opposites the two are actually tendencies in tension. One or other may be more dominant but the other is also always present. Even at the very 'point' of the wedge the two forces are still present. Escaping the horns of a dichotomy always helps, meaning I no longer have to align myself with either one choice or the other when really both are meaningful to me. I have been pondering this in relation to my archetypes of 'creative' and 'explorer'. The creative is constantly bombarded by a tumult of interesting external stimuli and a stream of new ideas and to escape this chaos is sometimes drawn to the calm of a more controlled minimalism. The explorer is quickly tired of the familiar and thus constantly looking over the horizon for the new and is drawn one step at a time further out into the chaos of the world. Looking again at the work I photographed and noted to share with you here I can see that actually all of them contain elements of both. Saunders is an interesting example of this. There is a quiet mastery that can focus on one line to produce a precisely controlled profile that then appears calm and simple, but each piece also has a depth of markings that speak of process and texture and chaos. Keeley's work is apparently opposite, giving an impression of expressionist wildness, but actually these marks demonstrate a strong fluency of gesture and a knowing when to stop. The point of balance is different but both are a marriage of forces. The show is on til 5pm Sunday 9th April if you want to check it out yourself. I'd highly recommend it. I had previously assumed that the fragility and price of hand-made ceramics would make them, by default, a rather adult affair. But recently I've had to re-think. I have gradually realised that my customers often actually have, or are expecting, a young family. I also realised how often people stop to look at my work with interest and then comment that one of their parents or an extended family member is or was a potter. And of course, I know that my parents had a set of hand-made tableware by Marianne de Trey that has been used for every special family meal I can remember for my whole life. So actually, introducing children to hand-made ceramics looks to be a great way to encourage them to value hand-crafted pieces, to really understand the additional tactile, visual and narrative pleasures of using something made by a craftsperson rather than a factory - not just intellectually but deep in their guts. It can encourage them to slow down and take care of special pieces, and later to seek out special pieces of their own. What better way to gently help shape the values of the next generation?! A student asked me last week if I secretly laughed at student pots. The answer is definitely a 'no'. I could say simply that no-one has ever made a pot that funny. But silliness aside, there are several reasons for taking student work seriously. Some years ago I did a tutor training workshop over several weeks that boiled down to one question: "Where is your attention?" Whilst teaching my attention needs to be firmly on the students, where they have come from, where they might want to go, and how best I can help them. Laughing at them is not a constructive part of supporting their learning. Obviously some students are more used to working with their hands, or the stages of the design process, or better prepared with ideas of what to make. The ideas and inspirations student bring can be surprising and eye opening. Others have less transferrable skills and may initially find themselves in uncharted territory struggling with unevenness or wavering profiles, weak joints and a multitude of cracks. whatever their prior experience, not many students will make professional-standard work in a short course and I don't expect them to or judge them for not achieving such a standard. And that's totally fine, students are there to learn and their work is looked at and responded to accordingly. All of them had the energy and the courage to try something new, all of them make some progress - and I commend them for that! Whatever point people come in at, if they manage to progress technically or creatively, or simply relax and enjoy playing with clay after a challenging day at work or with children or whatever, then I am happy and feel I have done my job. The most gratifying thing for me is to see people's creativity activating, the moments when the flash of new understanding happens, the proud glow when a technique is mastered after sessions of struggle. I have certainly learned more about ceramics from attempting to teach it, attempting to provide instruction forces me to be clearer and more explicit about what I actually know. For a physical process it's easy to otherwise skip this step! Plus working through a whole range of methods has encouraged me to think about ways to bring different techniques and materials into my work. Privately I am also conscious that I am only a few years out of evening classes myself and still have plenty to learn. Seeing student work reminds me of the distance I have traveled but I know the main difference between us is not innate genius or whatever but simply the amount of time I've spent practicing - if any student put a similar amount of time in they would see a similar degree of progress. It's therefore an honour to have people wanting to learn whatever I can share with them. "The clay will tell you how you are"
I love blog post from Jane Gross on her pottery class and how working with clay can help to reconnect us to our bodies - or be messily sabotaged by our monkey minds! It's so true - and yet a lesson that I have had to re-learn over and over. Thank you Jane for the reminder. "Like a balancing pose in yoga, ceramics provides a perfect feedback loop: exit your body and enter your busy mind, and you will likely teeter and fall. Or, in this case, try to bully the clay with strength, not stillness, and it turns into a guided missile rather than a bowl. The saving grace of this last class was that it nudged me in this direction of learning. It provided welcome calm, however belated, not at the wheel but at the sink. There, long after the others had gone, I was still washing the splash pan and a dozen tools I had used that were now unrecognizable under the gobs of clay. As hot water ran over my hands, and I squeezed sponge after sponge until one was clean enough to scrub my work area, my breathing slowed and my shoulders unclenched and moved away from my ears." "It's a hard way to earn a living"
Lots of little things have come together in a perfect-storm-style to prompt me to write this post. * A more established potter visited my stall, asked me about the pots and how my business was going. He also said "it's a hard way to earn a living". * I worked about 6 weeks straight with 2 days off, during which I was so tired I spent most of those precious days collapsed on the sofa. * My back got more and more unhappy, eventually requiring 3 trips to the osteopath & strict instructions to do the prescribed exercises twice a day for the rest of my life. * I read the Good Elephant blog's update on her hourly earnings project. * I calculated that last year despite working 6 days a week for most of last year I took home the grand sum of about £3.50 per hour. It looks as if Mr Established Potter may be on to something. Physically it's certainly laborious hard work being a potter. It's tough setting up a small business by yourself and being responsible for all the making and all the selling and all the admin and all the marketing and all the planning and everything else that 'should' be done. And it's hard living on £3.50/hr, especially in London. (For the same period the official minimum wage was £6.31/hr and the London living wage was set by the GLA at £9/hr). I'm not married to a banker so I do have to be able to support myself financially. In truth it means you work like crazy and come home with not much in the wallet at the end of the week, and are so tired you don't want to do any more. You don't have the money to go out and take advantage of the splendours the city offers and you don't have the energy to do it. And then the burnout kicks in. All of which might make a sane person if its really worth it. But I'm just not that motivated by money. I could have stayed in my previous career, sat out the restructurings, taken the promotion my then boss expected me to take. Had I done so I might have been pushing 40k p/a by now. But that salary would have come at a price. My previous job was already unbearably management-y, surrounded by team-members doing interesting, creative and socially useful things but me stuck at my desk, forced to wear smart officy clothes and spending my time sorting out problems, running budgets and the like. The promotion would have been worse. It would also have entailed moving to a different building where everything was grey, everybody hot-desked and you couldn't even stick a picture on the door of your locker (unless it was hidden on the inside). For a creative and visual person who likes to get their hands dirty that's about the working definition of hell. All that's a long way of introducing the possibility that talking about 'earning a living' is answering the wrong question. For me, the question is becoming more about how I can life a creative and fulfilling life. It looks at the quality of the total experiences of each day lived. I do still live in a country that likes to use money so I do have to think about that, but it's only a part of the equation. My answer to Mr Established is therefore to agree that yes, being a potter is hard work, and yes setting up a business is incredibly challenging. But as a way of living my life I am always grateful to have chosen this path and however hard it is I know that I have absolutely zero desire to go back to my old life. The last couple of years have brought endless challenges to my door, but they have also helped me to grow, to learn about myself, and to spend far more of my time actually being myself, being creative and getting my hands dirty. I have been able to celebrate heartfelt successes and spent my time doing something that really matters to me. Plus, I see signs that the business is growing and I have hope that the financial side of things may not always be quite so difficult. I don't imagine ever being rich but enough seems possible. The opposite of an hard way to earn a living would I suppose be an 'easy way'. As far as I can see easy money only ever comes at the expense of someone else and that doesn't sound like something I could be proud of at the end of the day. 'Easy' also doesn't sound very interesting for a life's work. In fact it sounds as if it would get boring very quickly. Being bored or ashamed of my work or stuck in a hell-of-a-job just for the money sounds like the hardest of lives. All things considered then, I'm happy to have found my path and I would choose it again hard knocks and all. Give your home a spring refresh, check out my sale now! Use the code FEOTL25 to get 25% off any order over £75. See what's available now, link in profile. Planning a feast? Get something special to serve it in and wow your guests! Updating your home this weekend? Why not take advantage of my Easter sale to get something fresh to give it a lift? Use the code FEOTL25 to get 25% off any order over £75. Get yourself an Easter treat that lasts! Use the code FEOTL25 to get 25% off any order over £75. See what's available now, link in profile. Psst! Look out for something special this evening! One more from the recent experimental series. I'm not convinced by the base but it does have a certain presence I think... Something to develop perhaps? 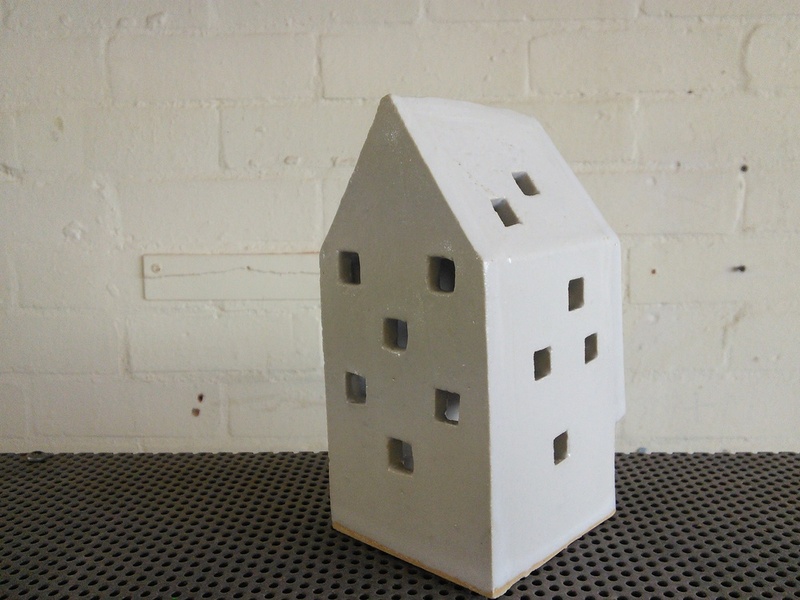 Dungeness piece, inspired by the cottages with all their extensions and lean-tos and sheds. You can't beat a shed!